Economists who can write! Amazing. I happened to come across this book while searching for another title I had heard about and was shocked at how accessible the material is. This is no text book. 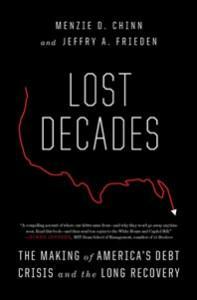 These authors, including the University of Wisconsin economist Menzie Chinn, do an outstanding job of explaining how the economy nearly imploded back in 2008. What was most enlightening about their account is that what happened to the US had happened to other countries in the past. Argentina, Mexico and Thailand are among them. We should have known better than to borrow so much from foreigners and then not adequately regulate the financial industry. In fact, the authors say the U.S. gave advice to other countries that we failed to take ourselves, which got us into a situation that nearly collapsed the entire banking system. "Many of the decade's failures were the result of a perversion of otherwise reasonable ideas, distorted for suspect motives," write the authors. They say there are good reasons to offer tax cuts, run deficits and accept foreign loans. And yes, it's good to promote home ownership, too. And now to the but. You knew that was coming. "But in America's lost decade, taxes were cut to curry favor with the wealthy and middle-income voters, to make it easier to starve programs the ruling party did not like, and to tie the hands of future governments," the authors assert. With all of that cash, consumers went on a spending spree and home prices soared. The party appeared to be endless, but the needle eventually scratched and many people shuddered when they lost their jobs, following revelations about complex, misleading financial instruments that many experts didn't fully understand. Importantly, Chinn and Frieden say the devastation to the economy and to families could have been avoided. "...the root of all the evil that befell the country was irresponsible government policies, policies that encouraged a foreign borrowing binge and consumption boom, policies that allowed financial institutions to take inordinate risks with an implicit government guarantee, policies that gambled with taxpayer money." They're referring to fighting multiple wars on a credit card without asking current taxpayers to share this burden, failing to collect enough revenue to cover our other obligations and offering cheap interest rates because of the flood of foreign capital. Posted on February 28, 2014 by Steve Busalacchi.